About a year ago an American producer and friend of mine said that he had heard from someone who had attended a conference somewhere that yeasts can survive for a long time in bottled extra virgin olive oil and that their activity is detrimental to the oil quality. I was sceptical. Once bottled, extra virgin olive oil it is thought to be one of the most microbiologically stable foods. I’m pretty sure that if you took your grandmothers olive oil out of her manky pharmaceutical studded cabinet, that was left to her by her grandmother, you could chug down the whole lot of it and not get sick. You may re-acquire a taste for fast food, but you’ll wake up the next day feeling ok. Effects of some oil-born yeasts on the sensory characteristics of Italian virgin olive oil during its storage (Zullo et al. 2013) I thought, ah there is the likely source of my American mates ‘Chinese whisper’ information. So do olive oil producers really have get yeast counts done on the bottled oil to ensure that their oil doesn’t degrade faster than usual? I have to say that have always treated research reporting potential ‘problems’ that no one has noticed before, even after making the stuff for a couple of thousand years. But with an open mind, I looked at the ins and outs of the very detailed paper closely. The researchers swabbed some EVOO’s, and ‘plated up’ what they found into a warm lagoon of yeasty heaven which allowed them to grow up enough yeast cells to inoculate a perfectly good extra virgin olive oil to assess the effects of yeast on oil quality during 4 months of bottle storage. But keep in mind that the number of yeasts found in olive oil is pretty low probably due to the fact that the relatively waterless environment of an olive oil isn’t their favourite hang-out. However, after culturing them up in the laboratory, they added them back at a rate of (wait for it), 25gms of yeast for every 100L of EVOO. That is about the same amount of yeast that winemakers used when they ferment grape juice into wine. In laymans terms ‘bucket loads’. To put the amount they used into an olive oil perspective, they estimated that they added around 100,000 yeast cells to every 1ml of oil. Compare that to the 1,000 odd yeast cells per ml that are naturally found in olive oil (based on a survey of 14 commercial olive oils from the Liguria and Central Italy, Zullo et al. 2010). So what effect did adding 100x the typical number of yeast to an olive oil and leaving it for 4 months have? Probably not surprisingly, the yeasts were shown by the researchers to produce all sorts of evocative (to a microbiologist anyway) enzymatic activity – Peroxidase, tyrosinase, phenoloxidase, and b-glucosidase, which could potentially degrade olive oil and affect its quality. But we all have ‘potential’ don’t we? Here are the effects that matter. The effects on the chemistry and taste …. Table 1: The effect* of inoculating with these large amounts of yeast and then storing the oil plus yeast for 4 months. *The researchers looked at the effects of half a dozen yeast types. I averaged their effects and presented them with changes to the same oil that had not been yeast inoculated and stored for the same length of time. ^Approximate value as the raw data was read off a figure, but it gives you an idea. They also found that yeast inoculation modified the profile of aroma compounds, with yeasty oils having lower amounts of the grassy tasting C6 compounds. Interestingly though, many other compounds that are normally associated with poor tasting olive oil (C7, C8 and C9’s) did not increase – indeed many of them decreased in the presence of yeast. There are a few ways of looking at these results, including that you could add yeast to your olive oil to improve its oxidative stability! Lower peroxide values and lower secondary oxidation values are good things right? Well that is what the data suggests. Others would look at the results and emphasise that polyphenols were reduced by 10%, and the oil was less fruity and some yeast produced a faint muddy aroma. But, despite the fact that the researchers appeared to try to use experimental extremes to induce an effect by all manner of yeast types, they barely dented the quality of olive oil. Where an extra virgin olive oil is bottled immediately after extraction, and is still ‘murky’, then maybe, just maybe these results may apply. However, oils of this type are meant to be consumed immediately as they have a high moisture content and contain relatively large amounts of vegetative solids. It is arguable that they would probably go muddy even without any yeasty action, as keeping vegetable solids in a highly anaerobic (airless) environment will most likely do that anyway. So hopefully we won’t be seeing tests for yeast cell counts any time soon. We have enough tests already. Zullo, B.A., Cioccia, G. and Ciafardini, G. (2013) Effects of some oil-born yeasts on the sensory characteristics of Italian virgin olive oil during its storage. Food Microbiology, 36, 70-78. Zullo, B.A., Cioccia, G. and Ciafardini, G. (2010) Distribution of dimorphic yeast species in commercial extra virgin olive oil. Food Microbiology, 27, 1035-1042. One of the most enduring myths about extra virgin olive oil is that if you heat it then it will produce more free radicals (and is therefore be more ‘toxic’ – or more appropriately ‘detrimental to your long term health’) than other edible oils. The belief in the binary model of ‘EVOO when heated is ‘toxic’, but every other fat when heated is not’ is plainly ludicrous. Why? Because the natural chemical composition of all edible fats including EVOO overlap, and in some cases significantly. For example while EVOO contains on average around 75% of the fatty acid oleic acid, canola oil averages around 60%, and high oleic sunflower about the same or higher than EVOO. 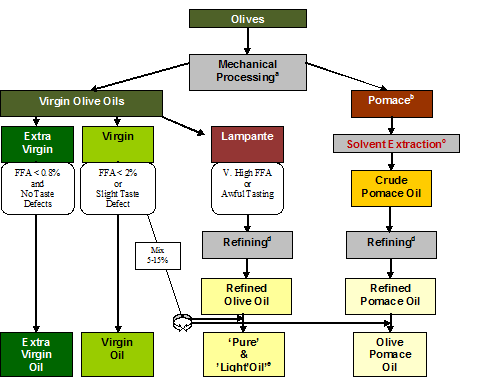 All oils contain sterols and tocopherols, and while EVOO has significantly more polyphenols than any widely used edible fat, polyphenols are more likely to inhibit the formation of free radicals Therefore unless the oil extracted from olives is somehow able to find a way to defy the basic laws of fat chemistry, then the idea that olive oil becomes more ‘toxic’ than other oils when heated can’t be justified. Recently a paper was published in the peer reviewed journal Food Chemistry (Tomassetti et al. 2013) which goes a long way to debunk the myth. Heating peanut oil and EVOO (even without antioxidant polyphenols) resulted in the same degree of free radical formation. (Figure 1). The longer you heated these edible fats the more free radicals they formed – both of them! Tomassetti et al. (2013) PO=peanut oil, EVOO=polyphenol stripped extra virgin olive oil. If the error bars shown at the top of the bars overlap then that means that there is insufficient evidence of a difference in free radical formation between the oil types upon heating. A peanut oil and an EVOO (with its natural polyphenols) were heated and compared with respect to rancidification. The researchers used an EVOO stripped of polyphenols as phenolic compounds interfered with the measurement of free radical production. Given that polyphenols mop up free radicals, I would predict that the net production of free radicals in heated phenolic rich EVOO would be significantly lower compared with refined edible fats that contain few if any phenolic compounds. The oils were heated to a reasonable cooking temperature. They were not burnt! Once an oil burns a whole different bunch of chemical reactions come into play. So is burnt EVOO any more or less healthy for you than burnt edible oil X? Probably not, but who cares.Just don’t use burnt oil of any type. It isn’t good for you. That is what the knobs on the front of the stovetop are for. Tomassetti et al. (2013) Biosensors for monitoring the isothermal breakdown kinetics of peanut oil heated at 180 C. Comparison with results obtained for extra virgin olive oil. Food Chemistry, 140, 700-710. Banning olive oil cruets on restaurant tables – Legislating for a perfect world? Yeah, that’ll work. Recently the European Commission on Agriculture put forward plans to ban refillable containers containing olive oil on restaurant tables, insisting they be replaced with unopened labelled bottles with tamper proof seals. The ban was immediately rescinded after considerable consumer and media backlash particularly from the non olive producer nations. Presumably the ban was proposed to in an effort to eliminate the practice of restauranters diluting their extra virgin olive oil at the point of ‘sale’. I have italicised ‘sale’ because in most cases olive oil is given away by the restauranteur which is a point that the proponents of the ban seemed to have not adequately considered. Before I begin, I declare that I am relaying some experiences from an Australian context. However, I cannot see why my arguments would not stand up in the context of European restaurants where the regulations were to apply. I have two friends ‘M&M’ who co-own a busy café in Adelaide, Australia. When I say, busy I mean the bustling, noisy type with each table hosting 3 covers (different customers) a night. The café like many others like them, offers a diverse range of cuisines including Mediterranean and also offer complementary good genuine extra virgin olive oil for customers as an alternative to butter. Like many local restaurateurs, they source their extra virgin olive oil from a local producer – from the McLaren Vale region, 30km from the city. They know the producer personally and have used his oils for some years. They trust him, and have no reason not to. I also know him and he is a fair bloke who is understandably proud of the EVOO’s that he produces. By selling in bulk he can profitably supply M&M with quantities of oil at good price. M: Hey, I give this stuff away for free. It costs me money. I don’t have to do it. I’m sure if I didn’t offer it, and put butter in its place, very few people if any would push my buttons over it. R: But surely olive oil is an important ingredient and part of the overall culture of eating? M: Both I and my chefs love extra virgin olive oil and the flavours that the oils brings, but the restaurant biz is difficult. Margins are tight. We look carefully at every menu item, and every input – costing it out carefully. Is it necessary? Are there less expensive alternatives? What impact does it have on the bottom line? Because ultimately, unless you can make a living out of the business you just shut your doors. And one thing for sure, I don’t owe olive oil producers or any other ingredient supplier a living. Now I’m pretty sure that when the European Parliament who immediately asked the European Commission to go back to the drawing board and consult with consumer groups and restaurant owners, that the above conversation is the sort they had in mind. So what effect would a policy of having to use labelled unopened bottles rather than dispensing oil into bowls or cruets? For the small producer, selling in bulk is often the only way in which they can make a decent return. Having to bottle, tamper-proof seal and label adds a significant cost, and as every producer knows, the relative cost of package to its contents increases as the package volume decreases. These additional costs will eventually have to be passed onto the restaurant either in part or in full. Given that most restaurants do not charge for the olive oil they serve, clearly having to pay more would be rather unpalatable and could potentially lead to EVOO being replaced. To M&M the idea of having small bottles around the café also makes no sense. There is the issue of storage and increased waste handling and costs associated with disposal. “We’ve got enough sh*t to get rid of each night, why would I want any more”. So what about the argument that having a branded bottle in front of the restaurant customer will promote the producers brand and lead to additional sales. I think it would be naïve to think that many restaurant customers would care enough to take much notice. Furthermore, most small producers have limited or no retail outlets outside their farm gate or local market, so even if a restaurant customer cared to notice the brand of the oil, I would presume that the chances of them chasing down a bottle the day after is very unlikely. But yes, it is possible that it could lead to sales, but the costs of compliance would probably outweigh the small marketing advantages gained. So why was the regulation proposed in the first place? The official line is that it was introduced in an attempt to eliminate fraud in the restaurant trade. However the measure does not address the biggest cause of fraud. That is the adulteration, or misrepresentation of the EVOO BEFORE it was packaged and supplied to the restaurant. While supporters of the proposed regulation will argue that having a bottle identified by a label will discourage this, I would argue that such measures have not stopped adulteration or passing off poor quality oil at the supermarket retail level where similar labelling requirements exist. So why would the measure work at the restaurant level? Unless policing occurs via chemical testing then the problem will persist. I would also argue that the regulation implies that the major cause of adulteration in the food services industry is the restaurateur. Such beliefs only serve to deflect scrutiny from up-stream sections of the distribution chain. Also being somewhat of a cynic, I noted that things of this magnitude don’t happen in the olive world very often, and nothing happens on a broad institutional level unless the big olive oil marketing conglomerates support it. Who would most likely profit from such a policy change? In short, packagers- and specifically those with the technical capability of bottling to the stringent specifications that were being called for. And who are the big packagers? Answer: The vertically integrated companies that buy oil in bulk before blending, bottling and marketing them under the well known supermarket brand names. I also wonder what share of the restaurant market they currently have? My guess is less than they would like. And where would this stop? What about opened bottles of wine served by the glass? I’ve been to plenty of eating establishments where the wine tasted like it had been opened for a while. I’ve politely brought the issue to the attention of the server, and they have replaced the glass of wine with that from a freshly opened bottle. No problems. Will opened bottles of wine be banned next? Unlabelled pepper? I’m all for cleaning up the EVOO industry of fraudulent practices, but realistically was this the right way of going about it? I think not. The idea reeked of an industry looking inwardly, rather than to the needs of its customers. It really was pretty dumb. Comments Off on Banning olive oil cruets on restaurant tables – Legislating for a perfect world? Yeah, that’ll work. Like crosswords? How much to you know about olive oil? Do you think you know about olive oil and extra virgin olive oil? Well this online cross word will test you. It’s easy to use. 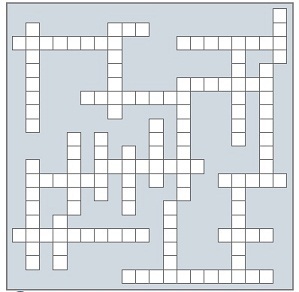 Open the link and the crossword will appear. Click on an word box and the question will appear. Type in the answer. Move onto the next word until you finish. If you type in a word is too long or short it will tell you. Click the solve box if you want to cheat. Hopefully even if you don’t get all the answers, you will learn something along the way. Here’s what it looks like…. Incidentally, the software used to create this crossword is free, intuitive, easy to use, and works seamlessly. You can use it to create both online and paper based crosswords. The crossword contains a link to the creators. Comments Off on Like crosswords? How much to you know about olive oil? For once I have a theme! But first, I must rid myself of a burden. There are no polyphenols in extra virgin olive oil. I’ve been resisting saying so for years, but now I must now confess. There is nothing poly(merised) about them. Yes, a couple of them could be a bit binary (depending on how you define it), but poly, errr no. Yes, many have a few optional extras like having attached sugars and esters hanging off them, which most certainly gives them interesting biological and health giving properties, but they are generally comprised of single simple phenolic monomers. They remind me of those troglodytes creatures that ruled the world during the Cambrian Period. There were thousands of different types – all very intricate and ecologically specialised, but in the general scheme of things, they were relatively biologically simple critters. Now I’m rid of the weight of this chemo-trivia, here are a few interesting, and practical research results about the phenolics in EVOO. Comment: The K255 index for bitterness was first proposed in 1992 and has been used quite widely by the international industry. Compared to total phenolics, K255 is a very easy and quick and accurate analysis. I’m not sure that the paper broke any new ground except that it provided a link between the K255 measure and bitterness ratings using the IOC rating scale. But of course the relationship given above is wholly dependent on the panel that provided the ratings. While bitterness is one the attributes on the official IOC rating sheet, to the best of my knowledge, unlike the defects, cross panel comparisons for bitterness is not conducted. Well it wasn’t done when I was a panel leader anyway. Regardless of panel differences, K255 still seems to be a good predictor of relative bitterness amongst samples. The relatively poor relationship between bitterness and total phenolics was unexpected. I have seen other data sets where the correlation was much stronger than reported here. Interestingly, the method used to determine total phenolics was not given which was a major oversight given that the method of extraction of phenolics from the oil plays a crucial role in the outcome. The method is also notoriously subject to variable results (where a 10% error is accepted by those who do them), so doing triplicate or more replications would be needed to ensure that the poor relationship between total phenol measures and bitterness wasn’t due to measurement error. Crushing between 1 and 10% leaves with ripe olives resulted in oils with higher free fatty acidity, peroxide value and K232 (measures of primary and secondary oxidation respectively). Adding leaves produced oils with higher chlorophyll aka they were greener. Adding over 5% leaves also increased oxidative stability and tocopherol content. Comment: Lab scale work. Phenolics were not measured which seemed to be an oversight given that both tocopherols and phenolics contribute to oxidative stability. Also personally, I’d like to think that the oil I buy is made from olive fruit rather than leaves. Call me old fashioned. Malheiro et al. 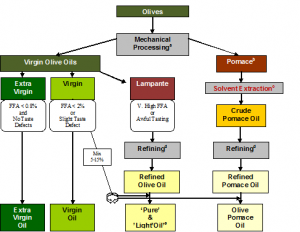 (2013) Effect of olive leaves addition during the extraction process of overmature fruits on olive oil quality. Food Bioprocessing Technology,6, 509–521. Malaxing for 40 minutes at 35C caused a 25% increase in both total phenolics and the pungent phenolic oleocanthal compared with malaxing at 25C (Figure 1), which could be explained by a 50% reduction of the activity of the major enzyme (polyphenol oxidase, PPO) responsible for oxidative losses of phenolics at the higher temperature. The longer malaxation time, the lower the total phenolics. Figure 1: Concentrations (mg/kg) of oleocanthal and total phenolics as a function of malaxation temperature (malaxation time = 40 minutes). Comment: Mill scale work (yay!). The fact that high temperatures can knock out PPO probably also explains why dipping olives into hot water prior to processing results in oils with higher phenolics. Bitchy comment: If you believe that EVOO is just a polyphenol dietary supplement (rather than a tasty food), then these results suggest that you should insist on HOT pressed olive oils. Taticchi et al. (2013) The inﬂuence of the malaxation temperature on the activity of polyphenol-oxidase and peroxidase and on the phenolic composition of virgin olive oil. Food Chemistry, 136, 975–983. Comment: The authors should be congratulated for recognising that long term consumption of a healthy food is only assured if it has an acceptable taste. EVOO included. But why not consume 60gms of something you really like, rather than 30 gms of something that you only like a bit? Rubio et al. (2012) Impact of olive oil phenolic concentration on human plasmatic phenolic metabolites. Food Chemistry, 135, 2922–2929.